The Hyundai Tucson is a compact SUV that was first released on the market as a 2005 model. Since then, the Tucson has earned a reputation among critics and consumers for offering an upscale interior and generous standard features at an affordable price. This quality alone makes looking for a used Hyundai Tucson for sale an excellent choice, but this compact SUV is full of even more surprises. Throughout the Tucson’s second generation, drivers can find a long list of standard features across its lower trim levels and more premium features across its higher trim levels. These features include leather seating, heated front seats, heated side mirrors, a leather-wrapped steering wheel, a leather-wrapped shifting knob, power adjustable seating, a cargo cover, USB connectivity, and Bluetooth. In its 2014 and 2015 models, the Hyundai Tucson even offers a 4.3-inch touchscreen display. In terms of power, the second generation Hyundai Tucson can be found equipped with a 2.0L 4-cylinder engine or a 2.4L 4-cylinder engine. Both engines are fairly powerful and capable, and offer a high level of efficiency. Drivers can find also find the Tucson available in front-wheel or all-wheel drive. With its 2010-2015 models, the Hyundai Tucson performed at the top of the compact SUV class in terms of interior quality, standard features, affordability, and efficiency. However, throughout the second generation various models featured significant upgrades and enhancements. So, which model is the right choice for you? To help you determine which model year and configuration is right for you, we’ll have to take a closer look at the used Hyundai Tucson. So, let’s get started! The 2010 Hyundai Tucson marked the opening of the vehicle’s second generation and featured numerous upgrades and a whole new set of standard features. In terms of design, the Hyundai Tucson features a sleek and modern design that clearly sets itself apart from its first generation model. Even today, drivers looking for a used Hyundai Tucson for sale will find models from 2010 and on to be extraordinarily modern. Design aside, the 2010 Hyundai Tucson is both powerful and efficient, featuring a 2.4L 4-cylinder engine that produces up to 176 hp and earns fuel economy ratings of 22 mpg in the city and 29 mpg on the highway. Drivers can also find both front-wheel drive and all-wheel drive models on the market. The 2010 Hyundai Tucson can be found in two trim levels, the GLS and Limited. The Limited trim is the more luxurious and features premium features like leather seating, an 8-way power adjustable driver’s seat, and cruise control. For safety features, this used Hyundai Tucson comes standard with anti-lock brakes with electronic brake assist, electronic stability control with traction control, and a full airbag suite. 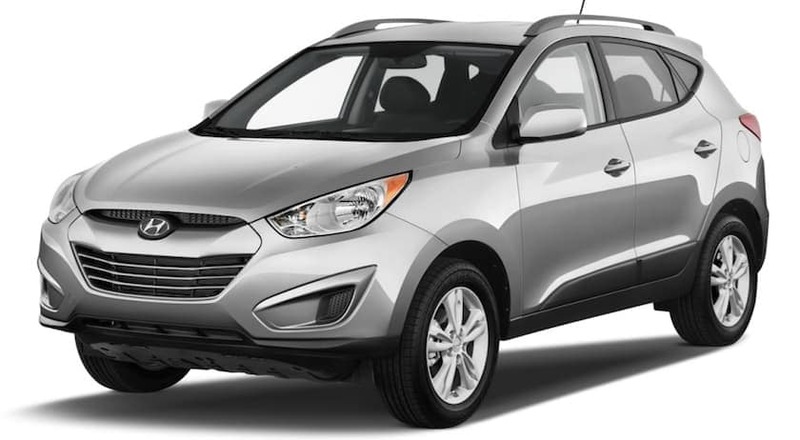 For the 2011 model year, the Hyundai Tucson added and additional trim level an engine option. The new trim level, GL, was now the base model and came standard with a 2.0L 4-cylinder engine that could be paired with either a 5-speed manual transmission or 6-speed automatic transmission. The GLS and Limited trim represent the second and third trim levels of this model and feature the former 2.4L 4-cylinder engine paired with a 6-speed automatic transmission. The GLS trim now receives a few premium features and offers standard features like leatherette touches, a leather-wrapped shifting knob, a leather-wrapped steering wheel, and Bluetooth. The Limited trim features its previous luxury and convenience features but adds an auto-dimming interior rearview mirror equipped with HomeLink technology. Standard safety features remain about the same as the previous model, but overall the 2011 Hyundai Tucson offers significant upgrades and more standard features than the 2010 Hyundai Tucson. Onboard the 2012 Hyundai Tucson, drivers will find standard USB connectivity, a 6-speaker sound system, and an air filtration system. Like the 2011 Hyundai Tucson, the 2012 Hyundai Tucson is available in up to three trim levels, the GL, GLS, and Limited. On the GLS trim, the interior is largely the same as in the GL trim. However, standard features on this trim level include roof rails, satellite radio, and an anti-theft alarm. Meanwhile, the Limited trim remains your best option to experience luxury features and offers leather seating, an updated automatic chromatic rearview mirror, a cargo cover, and available all-wheel drive. Carried over from the 2011 update, the HomeLink system remains a popular standard feature of the Limited model as well. For 2012, engine options include a 2.0L 4-cylinder engine and 2.4L 4-cylinder engine, which are identical to the options for the 2011 Hyundai Tucson. Drivers looking for as much power and capability as possible will want to opt for the 2.4L 4-cylinder engine in all-wheel drive. The 2012 Hyundai Tucson is also made fairly versatile by its maximum towing capacity of 1,000 LBS, which is excellent for the compact class for this model year. The 2013 Hyundai Tucson was a popular choice among consumers upon its release on the market. This model increases its standard features exponentially and adds several advanced and premium features across all of its trim levels. In fact, each trim level of the 2013 Hyundai Tucson were so abundant in standard features that very few package options were available. Trim levels for the Tucson remain the same as previously, the GL, GLS, and Limited. On all models of the Tucson, drivers can find standard features like USB connectivity, an auxiliary jack, 60/40 split folding seating, and keyless entry. A long list of standard safety features are also standard on all models including all of the previous features plus hill and descent control. Meanwhile, drivers investing in the GLS trim can enjoy standard features like heated front seating, heated side mirrors, roof rails, and automatic headlights and fog lights. The Limited model packs on the luxury with larger 18-inch wheels, leather seating, dual temperature controls, and a power adjustable driver’s seat with lumbar support. The only available package offered on the 2013 Hyundai Tucson is the Premium Package, which adds navigation, a panoramic sunroof, and an enhanced 7-speaker sound system. This package also features a rearview camera, which for vehicles of this model year is one of the more rare premium features. The 2014 Hyundai Tucson features numerous upgrades from its 2013 model, especially in terms of onboard technology. This used Hyundai Tucson can still be found in up to three trim levels, however they were changed for this model year to the GLS, SE, and Limited. On the 2014 Hyundai Tucson SE, drivers can find a 4.3-inch touchscreen radio with a rearview camera as standard, in addition to the standard features offered on the GLS trim of the previous model like heated front seats and heated side mirrors. While the Limited trim adds Blue Link technology to its list of standard features from the 2013 model. The Limited trim also features push-button start and automatic dual-zone climate control. Overall, the 2014 model is one of the best options for a used Hyundai Tucson for sale if you’re looking for advanced features at an affordable price. The SE and Limited trim levels are popular options for drivers purchasing the 2014 Hyundai Tucson, as their technology competes with much newer models. For 2015, the Hyundai Tucson features very few changes as Hyundai closes the second generation and prepares to open the third generation with the 2016 Hyundai Tucson. Trim levels remain the same as the previous model, GLS, SE, and Limited, and their standard features are essentially unchanged. However, the Limited trim level does offer an updated Technology package which upgraded the 4.3-inch touchscreen display to a 7-inch touchscreen display and adds HD radio, a 7-speaker sound system, LED tail lights, and a panoramic sunroof. The Limited trim is also further enhanced by exterior chrome trim and the 18-inch wheels from the previous model year. If you’re looking for a used Hyundai Tucson for sale with some of the latest entertainment features on the market and an abundance of premium features, you’ll enjoy what what the 2015 Hyundai Tucson has to offer across its three trim levels. We appreciate your interest in our inventory, and apologize we do not have model details displaying on the website at this time. Please fill the form out below and our team will quickly respond, or, please call us at (513) 421-1111 for more information. At McCluskey Auto, we offer an extensive collection of used vehicles for sale on our lot. Each vehicle is carefully maintained and inspected for quality, and features low and competitive pricing. However, as a reputable used car dealer, we won’t make you haggle for the best possible price on your next vehicle. Instead, we practice transparent pricing, which is supplemented by a variety of specials and incentives. At McCluskey Auto, you’ll also find one of the most flexible financing departments in the area. Our financing team is trained to secure financing for all types of credit backgrounds. So, whether you have perfect credit or low credit, we’ll walk you through your available options and help you secure the financing you need for your next vehicle. Once you’ve purchased your vehicle, you can always return for routine maintenance, complex repairs, and even to order parts and accessories. At McCluskey Auto, we will strive to offer a comfortable and enjoyable car-buying experience. So, when it’s time to take a look at used cars for sale, visit McCluskey Auto!